It was however a later arrival, Charles Cooke Hunt, who did the most to open up more of this eastern area. Charles Hunt lead four expeditions between 1864 and 1866 and while these forays did not discover the anticipated vast tracts of pastoral land the track and accompanying system of wells allowed many prospectors and settlers to venture into the interior once gold was discovered in the Yilgarn and Coolgardie some decades later. This day trip was researched and developed by Gary Arcus, a true archive trawler, to follow (as far as private land and local roads would allow) and visit some of these valuable water sources and gain an appreciation of the efforts of early explorers. Cancellations and poor memories by some members meant the trip was down to four vehicles by the due date but Gary, Brian and Chris Sercombe, Peter Mann and son Brendan and Peter Cole were all determined to follow the route and have a great day out. We were up early and all arrived at The Lakes Roadhouse for the meeting time of 8.00am. After Gary’s shock exposure to a hot black coffee, the single paper cup was very warm and also very full when he attempted to take the top off to cool it down, we headed off down the Great Southern Highway on our expedition. Unlike Charles Hunt we had accurate maps and a route plan developed in OziExplorer to follow. I might mention later we also had some other comforts that these intrepid explorers did not have in the 1860’s. First stop along the route was St Ronan’s Well , approximately 26 kms from the Lakes. While this watering point was established before Charles Hunt commenced his exploration to the east of York it was mentioned by Roe in the early 1830’s on one of his trips out to York. I wonder how many of us have driven past this small road sign without knowing the significance of such a facility to all those early travellers. 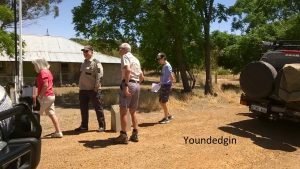 After an inspection and a reading of Gary’s historical notes regarding the well we moved onto York and beyond to find out first true Hunt’s well in the form of Youndegin, about 53kms from York on the Goldfields Rd. Youndegin was already a police post by the 1840’s , the current building has been looked after and refurbished by The Landrover Club of WA. After a quick inspection of the building and a look at the remaining well, Brendan provided a reading of the historical notes provided by Gary. For some of us, this was our second visit to this location and we have not yet been able to locate a “marked tree” which was recorded by Charles Hunt. Hunt’s early expedition located a number of native springs and water sources and in his later travels he was tasked with sinking wells to augment these sparse water supplies. Our trip only covered the ground once and hence our references jump forward and backwards in relative time to encapsulate all of the original expeditions. To enhance the historic experience Gary had researched and prepared extracts from Hunt’s exploration diaries which were distributed among the participants and read aloud at the appropriate location. From Youndegin it was a short 20km drive to the next well, near Tammin. 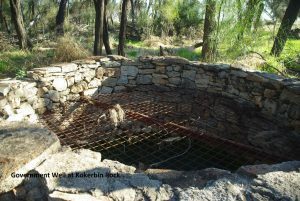 This particular well has a small picnic area with a shelter, provided as part of the York to Kalgoorlie Heritage Trail. Brendan provided the history notes for us at this point. Moving on from Tammin Spring we stayed with the Goldfields Rd which changed from bitumen to a good gravel surface and we made the crossing over the Gt Eastern Hwy to remain on the gravel road. After a quick inspection of the York to Kalgoorlie Heritage Trail signage, again within sight of the highway and again I wonder how many times we have driven past this point also without noting signage or appreciating the historical significance of this intersection. Early travellers had to follow Hunt’s route for the water resources but the advent of the motor car relieved travellers of the reliance on water to travel through these areas. The next location of one of Hunt’s wells is close to this intersection however as it is on private land it is not accessible for us to actually visit. 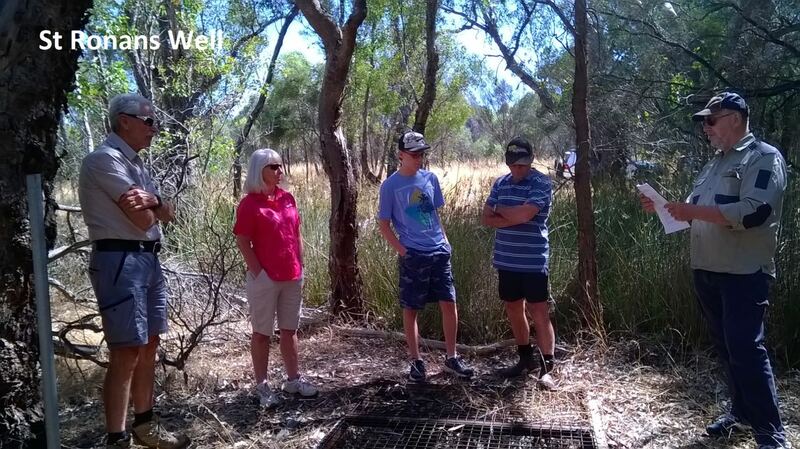 We then moved on to Marranopping Well, only a 25km drive from the Tammin Spring. Although this well is on private land the local owners have allowed access to the site for travellers. What we see today is probably a major rework of the original well, it is quite a large arrangement of stonework and even in December it still held a good quantity of water – not that we thought it particularly appealing to the eye or to our palate. 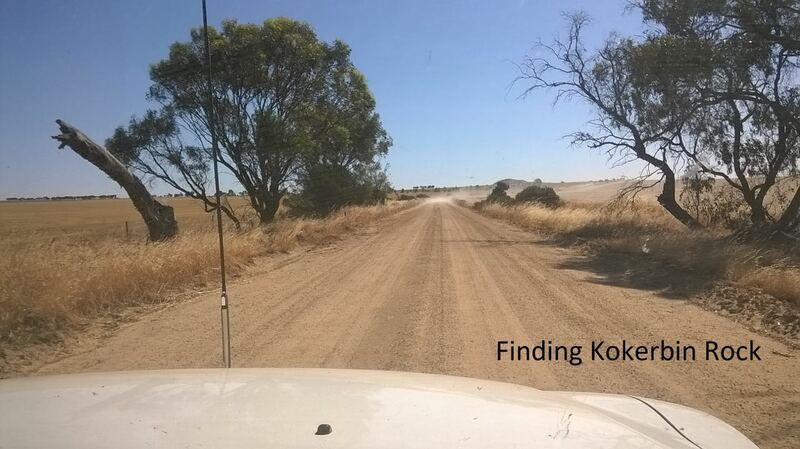 Unlike Hunt’s party taking two days to cross the 10km to Doodlakine Well ..they had to cut a track to allow their teams and wagons to pass, we quickly arrived via Goldfields Rd. 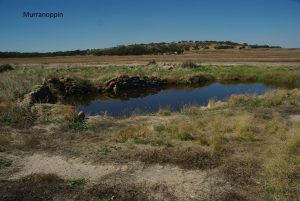 This well is approximately 6 kms north of the “new” Doodlakine townsite and after a short walk from the parking area Peter (the other one !) provided the historical commentary. With lunch in mind, we drove the 40kms through Hines Hill and along the Gt Eastern Hwy to Merredin where we found a very shady park to sit back and enjoy. I mention the shady spot as by this time of day, it was getting pretty warm outside the air conditioned vehicles. With Gary turning a deaf ear to our appeals for the trip leader to shout us all ice creams from the local Mr Whippy it was time to pack up and move on. 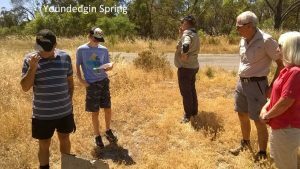 Merredin provides the final “outward bound” location on this day trip as we were not going to follow Charles Hunt all the way out on his expeditions. Turning south it was off to find Totadgin Well which in it’s present day form is located within Totadgin Conservation Park and about 11kms from Merredin. With Chris once again reading the historical notes (Brain had claimed immunity as he was their driver) a discussion ensued about the terrible conditions and hard work of the exploration team in these hot and dry parts. The diaries showed the expedition was here in February 1865, and with consideration of the degree of manual effort to sink the well in this rocky place we all agreed the earlier settlers, explorers and local people must have all been very hardy people indeed. Setting out from Totadgin , Gary announced that his vehicle gizmos were showing an outside temperature of 38 degrees C, and yes we did all have the car airconditioning on. Totadgin Well was the last of Hunt’s wells we would be able to locate on this day trip and marked the start of our return journey. 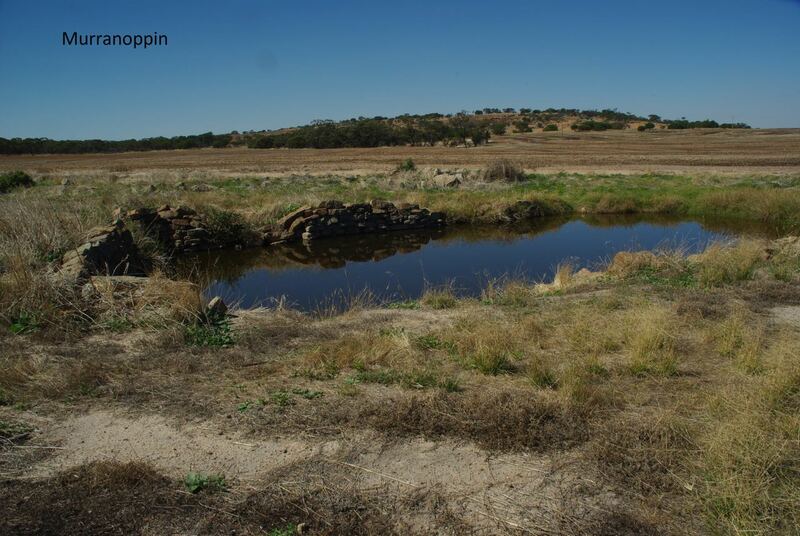 Some 20kms SW of Totadgin is the location of Metchering , another of Hunt’s Wells also now on private land so we had to be satisfied with looking over our shoulders into a farmer’s paddock and making an acknowledgment on the uhf radio that we were passing it. 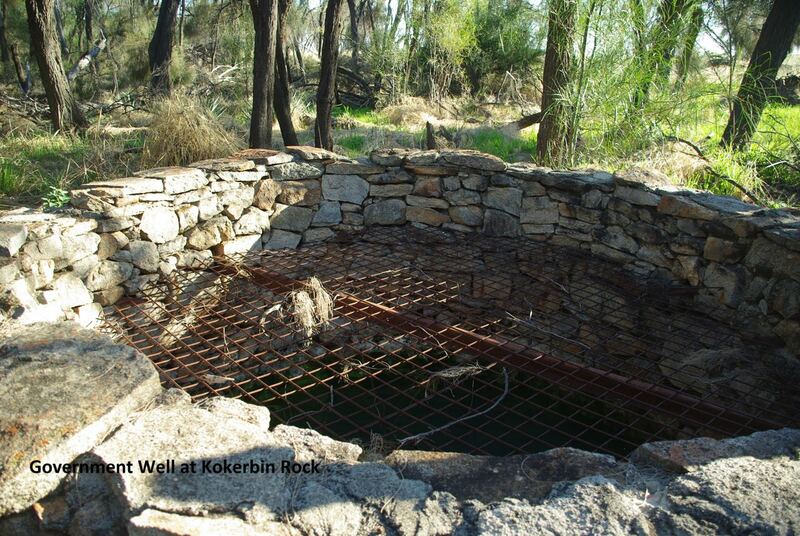 The final well that we located and inspected was the Government Well at Kokerbin Rock, not one of Hunt’s but a fine example of the early well construction techniques in this area. To round off this day trip we set our sights for Mt Stirling, adjacent to the Kellerberrin Yoting Rd, and then further west to visit Toapin Weir. These last two locations had no connection to Charles Hunt and his expeditions, however they were interesting places for some to visit for the first time and it provided breaks for drivers on the homeward leg of the trip. Staying with his intention to use local gravel roads Gary led us off on what I think would be the most indirect route ever taken on a club trip, I lost count of the TL and TR instructions after the first couple of dozen all to avoid bitumen..!! We found the parking area next to Mt Stirling and had a quick coffee break but only due to the late afternoon time of the day and the need to find the weir it was decided not to attempt a group leg race to the top of this rather large rock feature. Had there been vehicle access we might have made a move to get to the top but to everyone’s complete disappointment Gary made us drive on without the satisfaction of ticking off another ‘high’ point. 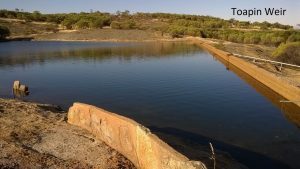 Driving down Mt Stirling Rd until we hit Toapin Rd we made short deviation into the Toapin Weir Reserve to find an amazing sight. None of us had ever visited or even known of this construction before today, and as the last place of interest for the trip it was very impressive. 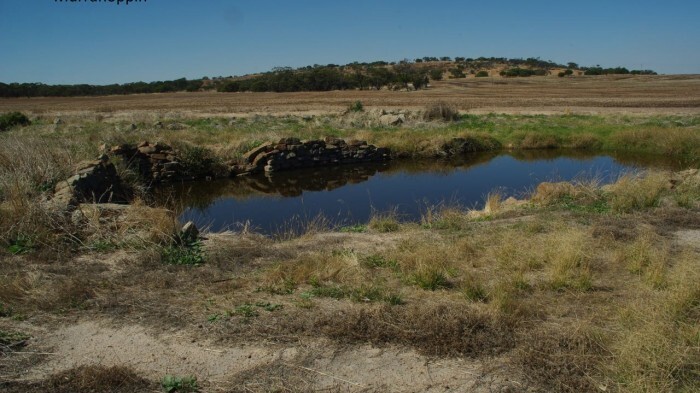 Originally built as a water source for the town of Quairading, the weir is very full of water and a walk around the adjacent rock showed the great endeavor made to provide a secure source of water for the town, some 10kms to the south. This place has a day use area and drop toilets and would make a place of interest whenever you are in the area or passing through on a club trip. Setting off from the weir we made short stop before the Quairading York Rd to air up tyres and then made the run for home. As we turned into York it appeared we all had separate plans to get home from here and after a round of compliments to Gary for arranging this excellent trip into the past it was back to Perth in our own time.